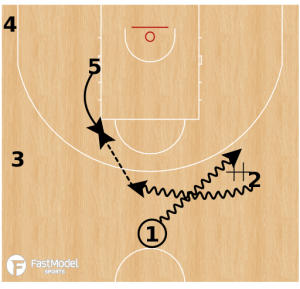 Two Man to man plays from FIBA U20 European Championship 2018. The plays were contributed by Sergey Tkachenko from Perm, Russia and currently a scouting coach for BC Parma Youth Under 21 team. 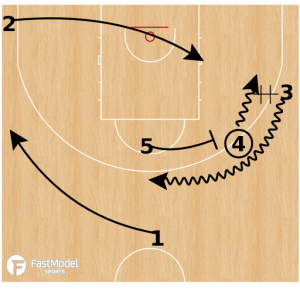 to the FastModel Sports Basketball Plays and Drills Library. Play starts with double Iverson cuts by 3 and 4. 4 catches pass from 1 on wing. Pistol action (4 DHO with 3 and then PNR with 5) as 1 and 2 space. 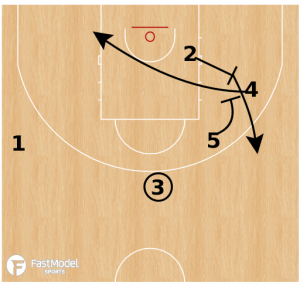 STS action with 2 as primary option, 4 in post as secondary option. 1-2 DHO to initiate play. 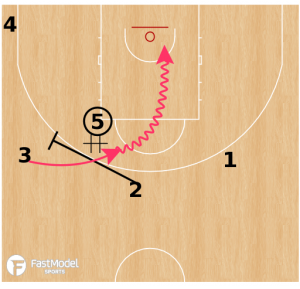 5 flashes to elbow and receives pass from 2. 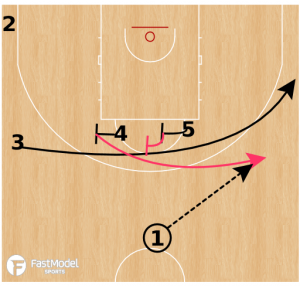 2 screens for 3, who takes hand off from 5 and penetrates strong to basket.